Lee Kuan Yew was the founder of Singapore, and known to be an incorruptible personality, and a visionary. He has an ideal hand in some respects: a large broad palm, fingers of medium length, mounts neither flat nor overdeveloped, well-etched long, balanced lines on a firm palm and a good low-set thumb to boot. All these signs point to a balanced character without personality quirks or eccentricities, a broad, progressive outlook, strong purpose, and a clear head. Lee Kuan has been criticized for being a dictator and curtailing freedom of speech. Where is this shown on his hand? view the term (in a derogatory fashion). When one thinks of leaders of a dictatorial nature, one cannot help but think of leaders like Robert Mugabe or even Indira Gandhi. You can check out his hand photo here. What makes Lee Kuan different? While idealism is usually present in the personalities of dictators (and shown on Lee Kuan’s hand as well), what saves Lee Kuan is his genuinely philanthropic nature and broad thinking. The broad outlook is as important as benevolence; without it, the benevolence would be directed wrongly. When personality characteristics like benevolence and a broad perspective are combined with idealism, a calm yet firm resolve and clear thinking, a person would go to great lengths to see his dream realised. Unselfish is simply not a strong enough word to describe Lee Kuan's intentions. Some of the other distinctive features of Lee Kuan's hand are the long first and third phalanges, the waisted thumb, developed Lower and Upper Mars (but not the Plain of Mars), stiff hand, bent Jupiter finger with a conic tip, a slightly low-set Heartline, a long Apollo finger, and a line from the Headline joining the Heartline under Apollo. His hand is that of a hard-working person who expects the same of others – a tough disciplinarian. He was controlling, even a little manipulative, and warmth of personality and flexibility were not his forte either, but the lack of adaptability is redeemed by inherently good judgement and fine diplomacy. His hand shows no desire to be rich. Unfortunately, Lee Kuan Yew's hand photos do not show his Headline clearly enough, and it is difficult to know how it ends. Some photos show his Headline to be sloping, and others, straight. His left hand appears to have a simian line. 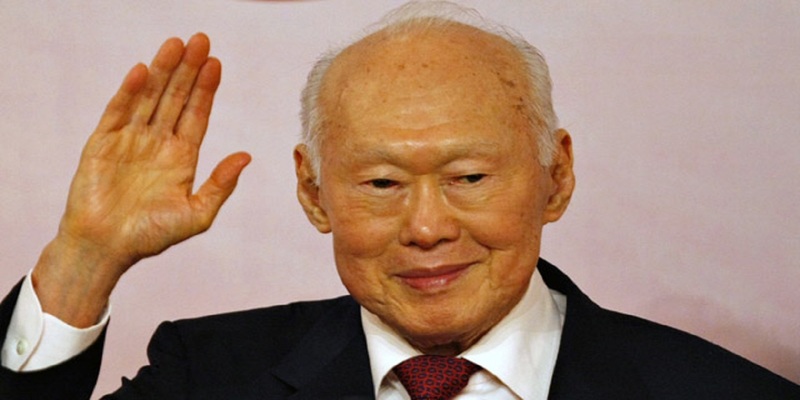 Lee Kuan Yew (nickname LKY), died at 92. He was the first Prime Minister of Singapore over three decades. He voluntarily retired at the age of 67. He changed Singapore into a modern, first world country in just one generation. Or find out what the hands say about the Heads of State of different countries around the world. I think there is very little to differentiate between a good leader and dictator. It often requires a dictatorial mentality to become a good leader because that's often what works! A dictatorial mentality of a leader works well in an unstructured and weak system, but the country benefits only if the intentions are good.